CES 2015: Sony launches a trio of budget Blu-ray players | What Hi-Fi? Sony has launched a new range of budget Blu-ray players for 2015. It comprises three models, all of which include wi-fi connectivity, smart functionality, a new shape and minimalist design. The new range kicks off with the BDP-S5100 (£70, due February). It's a no-frills machine, so there's no playback of 3D Blu-rays nor is there any DLNA support. Sitting in the middle of the three-strong series is the BDP-S4500 (£85, due March), which adds both of these features, while the BDP-S5500 (£100 due March) also brings with it Screen Mirroring on a compatible smartphone or tablet. 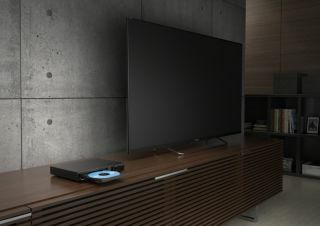 Sony's advanced super wi-fi technology is also a feature of the BDP-S5500, which is said to allow a more robust connection to your wireless home network. We've also been informed by Sony that the Award-winning BDP-S7200 will continue well into the New Year.